RIT student Lindsay Reardon thanked McChord at the news conference for investing in students. RIT student Lindsay Reardon is thrilled about the opportunities that are in store for students anxious to create and manage their own businesses. An entrepreneur by nature, Reardon is no stranger to self-employment, beginning as a high school student creating posters for weddings, anniversaries and other special events. Today, the Saunders College of Business MBA student is digital marketing manager for OWA Haircare, a student-run startup that has developed Moondust Hair Wash, a waterless shampoo that saves water, plastic and energy and contains ingredients that are naturally derived. Reardon’s initial interest in RIT focused on film and animation, but she soon developed a love for finance and marketing and quickly realized that her unique skillset was an asset to student teams with innovative ideas. Reardon said she became involved in entrepreneurship in 2009 when students were being recruited to participate in the Saunders Summer Startup program through the Albert J. Simone Center for Innovation and Entrepreneurship. 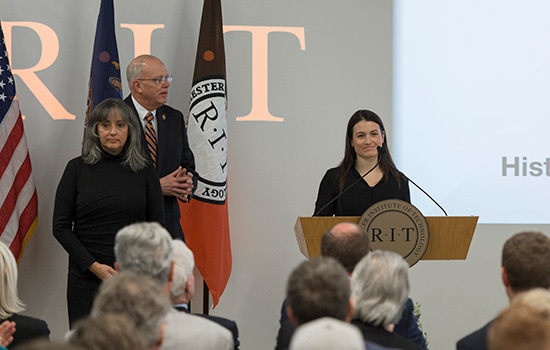 Reardon, who is from Granby, Conn., is inspired by Austin McChord’s $50 million gift and said his generosity will present RIT students with even more opportunities than she had when she started developing her business ventures. She was also impressed by news of a fellowship that will allow for a gap year, giving student entrepreneurs opportunities to work on their businesses full time. Reardon and OWA Haircare founder Kailey Bradt, a product development master’s student, recently took their hair-care product to Europe to engage and brainstorm with investors, innovators and industry experts at the Hello Tomorrow Global Summit. And earlier in 2017, OWA Haircare won first place and $10,000 in the “products” category at the eighth annual New York State Business Plan Competition. Reardon knows there are countless RIT students just like those on the OWA team—“doers” with great ideas and the commitment to make things happen.